Inspired by the news that Prince Albert, son of Princess Grace (and father of two children who cannot inherit the Monaco throne due to being born outside marriage) will finally wed, I started remembering the royal weddings of the 1980s. First, of course, was Diana's. Sure, Prince Charles was somehow involved, but it was really all about her. Shy, pretty but at first unaware of that fact, born with a title but had lived on her own and worked the same kind of menial jobs many of us would someday take on (nanny, cleaning lady, kindergarten assistant). She must have been unable to believe her luck when she found herself engaged to the (supposed, we shall see) future king (who had once dated her older sister). It was the 1980s, but early--1981. Eighties extravagance was just about to blossom. And those of us (mostly girls, face it) who tuned in at 4 in the morning were dazzled. 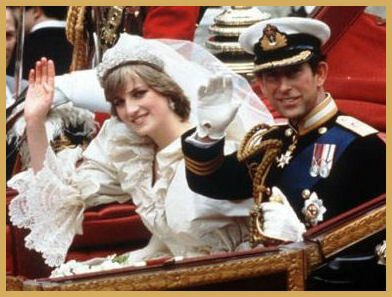 We had never seen a royal wedding before -- some of us perhaps had never seen any wedding before. And some of us imprinted on the details like baby ducks, assuming that all weddings should have a horse-drawn coach, a diamond tiara, a voluminous gown with enormous veil and train. Then, of course, it all fell apart. And those of us were became obsessed royal watchers (yes, I still have my copies of Royalty Monthly and Majesty Magazine), are able now to look back and know that even as she walked down the aisle on the arm of her trembling father (recovering from a stroke), it was probably already doomed. But we knew none of that in 1986, when Diana's pal Sarah Ferguson came along and wed Andy. Her dress was a little more streamlined, her wedding a little smaller, her hips a little larger, but she had an impish charm that made her seem real. And that marriage, of course, fell apart also, although even after Fergie's disastrous recent attempt to sell access to Andy, the two seem to have remained friends. There have been more royal weddings since Diana's and Fergie's, but none have, or likely will, capture the imagination the way that theirs did. The time was right -- or wrong -- for an entire generation to fall under the spell of the veil. Did you get caught up in the royal weddings back in the 1980s? I moved to London for ten years, at age 20, after having become embarrassingly "interested" in England after the royal wedding. I was four years old when it was on, and told my father I was going to move there someday. He told me that I probably wouldn't be able to make that happen, which pretty much guaranteed that I would. But it started with Diana-mania. Being a guy, no, I didn't. But, in 7th grade a girl in my class was obsessed with it and wrote a report on Charles and Diana. I thought that was kind of odd at the time. I didn't realize it was such a big deal at the time. Oh,yeah! I'm so old I got up and watched Princess Anne's first wedding. I missed Andrew and Fergie's but did tune in in the early 90's for Edward and Sophie's. I was too young to remember Chaz and Di's wedding, but I remember getting up early to watch Andrew & Sarah's. At the time I thought Sarah was so pretty and fun. A lot of little girls wanted to be princesses because of those weddings, but now you couldn't pay me to marry into that crazy family! My mom, sister and I got up and watched both Royal weddings. Mom even made scones and tea for Fergie and Andrew's, which were awesome at 4AM. I liked Fergie's wedding better, and loved her dress - Diana's dress was stunning, but a poofy nightmare IMO. You could barely even see her! Fergie and Andrew seemed so happy, but I never liked Charles and felt sorry for Diana. Little did we know how sad things would actually turn out for her. Poor thing. I cried for a week when she died. I was in high school at the time, and remember "Chuck and Di" being a big deal. It was one of those things you couldn't ignore. My mother, an unapologetic Anglophile, was totally transfixed throughout the whole thing and watched every bit of it on TV. Later on, she was really upset about them divorcing. There wasn't anything quite like it until Diana died. My wife and I sat up past 3 AM to watch her funeral.